The study predicts that, in a warming world, migratory birds will become increasingly restricted to small islands in the Arctic Ocean as they retreat north. This could cause declines in hard-hit regions and some birds could even completely change migratory pathways to migrate closer to suitable habitat. "Climate change is also opening up the Arctic to threats such as mining and tourism, and we must make sure we protect key places for all Arctic species, including these amazing migratory birds," Ms Wauchope said. UQ's Associate Professor Richard Fuller from the ARC Centre of Excellence for Environmental Decisions (CEED) said most migratory populations followed well-defined migratory routes. "This makes shorebirds an excellent group to investigate how climate change might impact breeding grounds and conservation actions that could address these impacts," Associate Professor Fuller said. 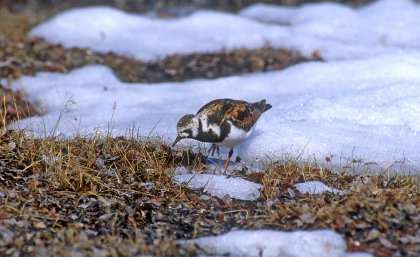 The research modelled the suitable climate breeding conditions of 24 Arctic shorebirds and projected them to 2070. The researchers also examined the impact on Arctic birds of the world's last major warming event about 6000 to 8000 years ago. "Climatically suitable breeding conditions could shift and contract over the next 70 years, with up to 83 per cent of Arctic bird species losing most of their currently suitable area," Ms Wauchope said. "This far exceeds the effects of the last major warming event on Earth, but genetic evidence suggests that even then the birds struggled to deal with the warming." She said that suitable climatic conditions are predicted to decline fastest in the areas with most species (western Alaska and eastern Russia), where Arctic birds are already becoming vulnerable to the "shrubification" of the tundra, and predators such as red foxes moving north. Smog Warning Days (actual "smog") have been rare for decades in most of N. America not because of anything "green", it was a result of the "science" of clean burning leaving the abundance of fossil fuels from fracking a reliable source of energy for countless generations to come. And this ending of the oil wars is leading to possible world peace. And this while longevity rates still rise every year. Be happy! *How many climate change scientists does it take to change a light bulb? None, however they do have a full 97% consensus that it "could" change. Be happy and spread love for the planet not needless fear for it.